Thing about that ratatouille recipe is that it doesn't fill us up on its own. 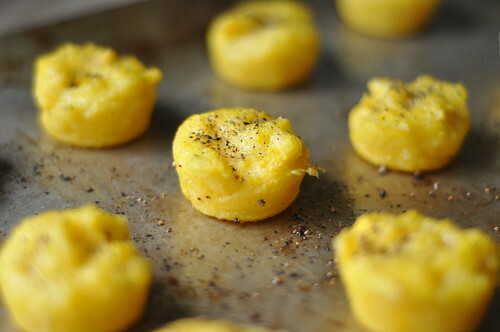 That's why I made up these peppery polenta bites to accompany dinner. They were definitely an afterthought. We hadn't made polenta in a while, so I mixed up a batch because I thought it'd go well with all the veggies. Then Ada got fussy/tired/cranky right when I was about to pour it into a large baking dish and chill in the fridge. Her impending nap meant I had some more time to put it into our mini-muffin tin. 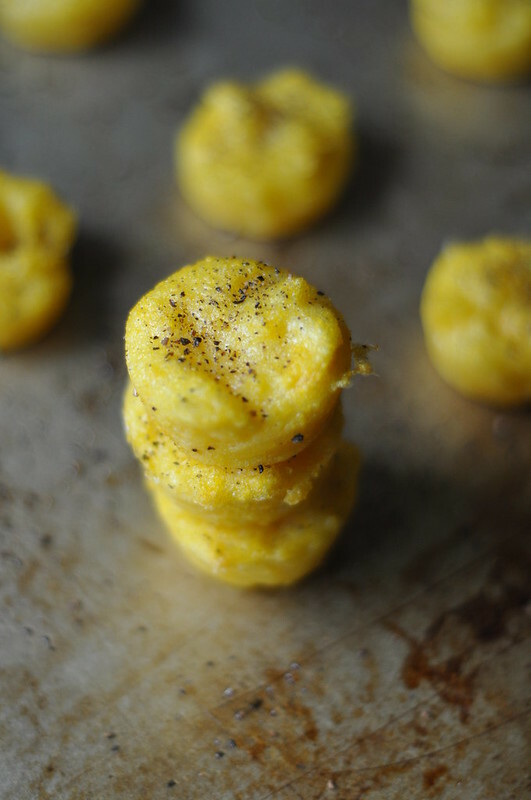 Anyway, if you haven't made polenta before, it's quite easy. Just add the salt to the water and bring to a boil. Turn heat down to a simmer and whisk in the cornmeal 1/4 cup at a time. Stir vigorously to prevent lumps and bumps. Add in the olive oil and keep stirring for around 5 minutes. Then pour into a baking dish -- in this case, a mini muffin tin -- and chill in the refrigerator for a couple hours. All you need to do to make them crispy and peppery is to preheat your oven to 400 degrees F. Spritz a baking sheet with olive oil. 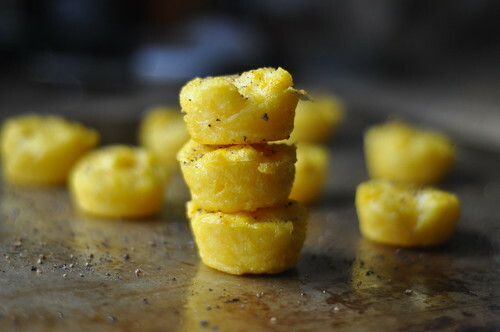 Then place your chilled polenta bites on the sheet. Spritz each with a bit of olive oil and then generously top with pepper. Bake for 30 to 40 minutes -- until crisp. Serve with dipping sauce of your choice. Or ratatouille goes great with them, too! 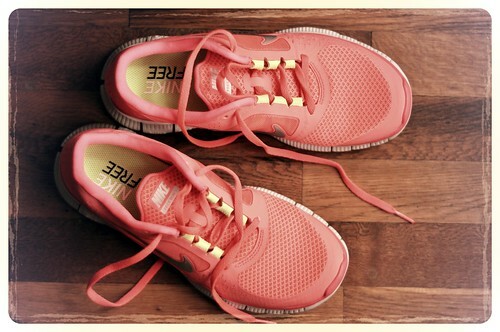 In other news, I finally bought a new pair of running shoes last night. For the first time in a year, in fact -- and I desperately needed them. I don't pay attention anymore to the specific mileage guidelines for when to get rid of shoes. Instead, I take each run as it comes and evaluate how my legs feel afterward. These shoes felt dead these past couple weeks. I tried on many different shoes, as a few of you wrote me to say the Nike Run + 2 and + 3 didn't feel the same as the type I'm used to. Stephen had me try on the Brooks Pure Connect (my heel felt so wobbly and lower than my toes -- didn't like it at ALL! ), Saucony's Kinvara (eh...), and a few other more minimal types. 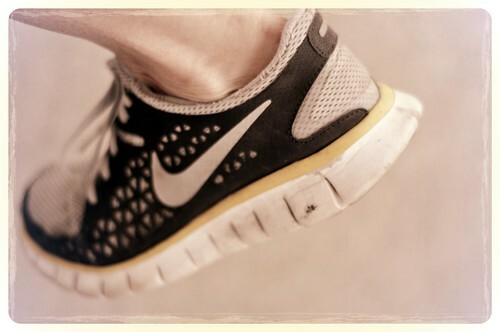 I tried on the Run + 2s and HATED them. Something about the decorative side plastic-y things didn't feel right on my feet. But when I slipped my foot into the +3s, I fell in love. Too bad the store only had the most obnoxious, neon color known to man. I edited to to mute it out. If you have sunglasses handy, here's the true color. Oh, yeah! And with several coupons and store credits (from using the store's loyalty card), I didn't spend the $100 retail price. Closer to $60. Nice. 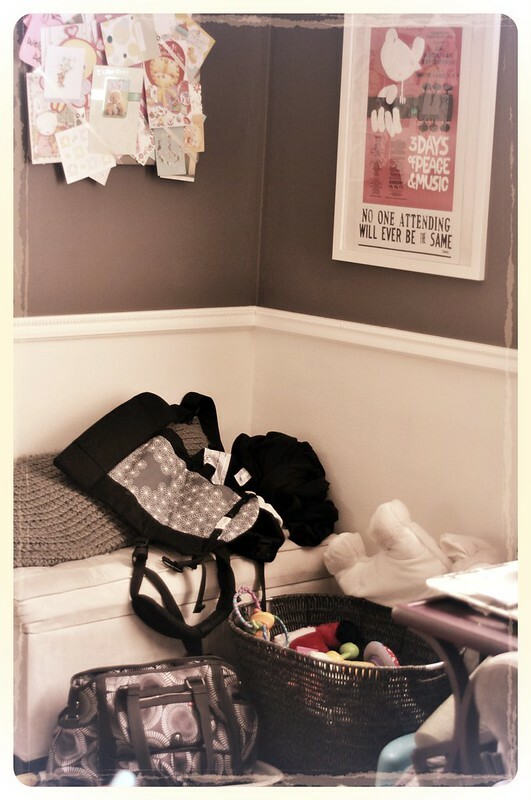 Today on Writing Chapter Three I wrote a longer-than-it-needed-to-be post about our toy storage and cleaning situation. I'd love for fellow parents to let me know what they do to wrangle all their loot. My entire house looks like this one corner does right now.